Carolina Victory Garden | A journal of my vegetable garden. Lessons learned and insights gained. A journal of my vegetable garden. Lessons learned and insights gained. When my children were young there was a popular movie and book about an entire community of brilliant rodents who lived under a bush and their desperate attempt to save their home from the evil farmer who was planning to expand his garden. It was a cute story and it entertained the kids and sparked their imaginations on cold Alaskan days when a quiet time was in order. More than 40 years ago there was a fence surrounding the point and other parts of our little farm. In my memory, the fence on the point has been gone except for a fence post here and there. Now there is only one left and it is in danger of failing from the ravages of time and a certain puppy. The fence post is covered by an ancient wild honeysuckle vine and it looks to me, much like the bush in the movie my kiddos loved to watch. Chloe seems convinced that “someone” is living in or under the vine and every time we let her out into the yard she trots over to it to see who is home. This involves barking, circling the post and vine and then inserting her head and half her body into the tangle eagerly in order to “greet” any new friend that might be brave enough to reveal their presence. Loki gets in on the act now and then, but for the most part he tries to act a bit more dignified. We did expand our garden plot this year, but it will not require the removal of the honeysuckle vine. However, it now appears that Chloe, in her enthusiasm may have nudged the fence post too hard causing it to break off at the ground where it was most vulnerable. Questions arise. How can we put a new post in without disturbing this ecosystem? Do we WANT to even try to do that? Should we take the opportunity to simply remove the vine and the remnants of the post since the vine is a bit scraggly anyway? Is there something we might consider putting back in its place if we remove it? How will all of this effect the creatures who call that vine tangle home? I am sure that there are birds, rodents and insects who live in that tangle and it does still make a few flowers every year, fewer and fewer, but still flowers that entice bees, birds and other friends of the garden to visit. What is the best decision based on good permaculture practices? Sometimes choices are hard. There are many decisions to make when transitioning to a larger, more rural gardening space. Should we continue to garden small scale? Should we garden on a larger but still modest scale? Could we have a hobby farm/homestead with vegetables AND critters of one sort or another? That discussion is still ongoing. Last summer I took a class called Sustainable Small Farms and Back Yards through the Clemson Cooperative Extension. It was a wonderful class and I learned a great deal about what could be done on a small farm of 10 acres or less. (Disclaimer: I do not work for Clemson University or its Cooperative Extension Service and receive no benefit for providing you with this link.) We covered vegetable and fruit production, small farm animals and bees. We also learned a little about marketing your farm and what is required to sell your produce to the public. I came away with a very fat notebook full of resources for future projects and information. For the moment, my main goal at the Carolina Victory Garden is still the same: Growing enough vegetables and fruits to feed my family regularly, year round and having some left over to share with others. So far my helpers and I have enlarged the Country Garden by, well, a ton. In 2015 we will garden almost 1/4 acre of land. 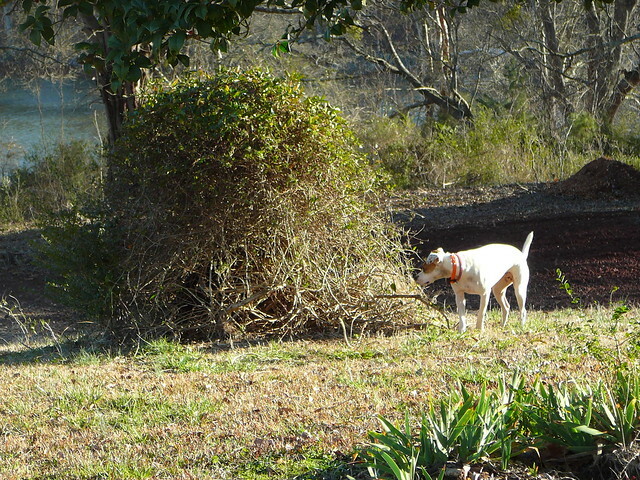 We have a landscaping plan for the yard and a plan for an orchard and berry patch. There is also a lot of clean up and brush clearing to do. We will not get all of this accomplished in one year, but we will get there step by step and have a little fun in the process. I’ll discuss this year’s goals in another post. It’s been a very long time since I posted on this blog and I have missed being here with my gardening friends. Last year we realized one of our major goals. We moved to the Country Garden full time. What does that mean exactly? It means we have bid goodbye to our companionable gardening neighbors and to the collection of raised beds that made up the original Carolina Victory Garden. Our home is almost three hours farther west and it is surrounded by water on three sides. 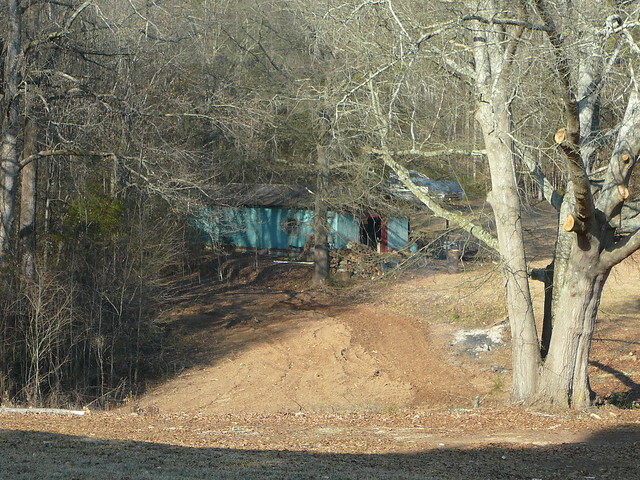 Some of our closest neighbors are visible from the yard but most are not. Its dark enough at night to really see the stars. The new Carolina Victory Garden has grown exponentially over the past three years as we have tentatively experimented, applied what we’ve learned, acquired tools to make the work easier and more effective, and grown in confidence that perhaps we may actually be able to supply vegetables for our family year round. Our first garden in this spot was small and what the deer didn’t devour, my gardening companion ran over with his new tractor while trying to pull steel supports our of the ground next to the garden. (He really was trying to be careful, he just got into the moment.) Last year’s garden was roughly twice the size of the one in the link above. This year, I’ve actually measured the garden. 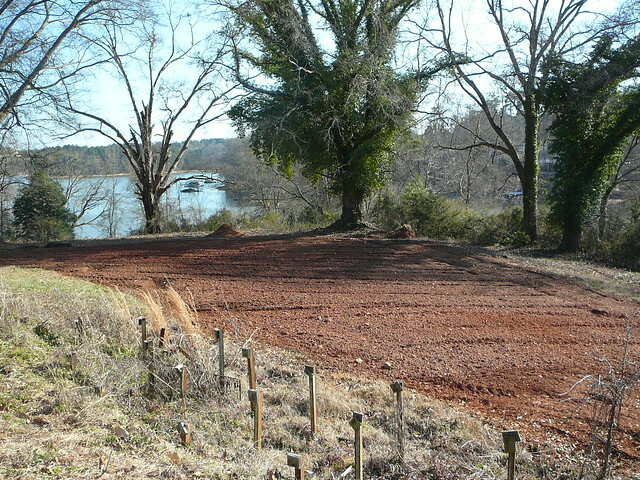 This site will be almost 3000 square feet, twice the size of last year’s garden plot! My gardening companion has decided to get more involved as well. He will be using the garden site his parents used when he was growing up. That will add another 4000 square feet to the garden. Our plan for the moment is to plant the Three Sisters; corn, beans and squash in what will be known as the Lower Garden. It’s down the front hill from the house. Perhaps we will even put a row of flowers in the Lower Garden to entice bees to buzz on by for a visit. Everything else will be planted in the original Country garden. I’ve been adding the 2015 Planting list to the Planting List page. Perhaps I’ll also discuss it in a future post. There are reasons for some of my choices that might provoke discussion. For now, let me welcome you again to the NEW and improved Carolina Victory Garden. Stop on by now and then to visit, get a few laughs and make a new friend or two. The first fix for the tomato bed is in place. Step one is a length of soaker hose to deliver water closer to the roots. The next step will be to add some mulch to cover the soil as suggested by Fourth Generation Farm Wife. I’ll keep you updated on the progress. I am afraid that the state of the rest of the Carolina Victory Garden in Fort Mill is quite sad. The carrots and beets have sprouted as have the crooked neck squash. None of the other seeds I planted have sprouted as of yet. In addition to this problem, I seem to have an over abundance of grass growing where the seeds should have sprouted. My guess is that either the grass seed was in the compost I added this year or it flew there when the yard was over seeded. We have been quite busy with work and have probably paid less attention to the garden as I should have. Needless to say, I’ll be spending several hours over the next few days eradicating the grass from the raised beds in between business meetings! I planted my tomato seeds in the front raised bed in the Carolina Victory Garden at the end of March during the first warm spell. Of course, a week later, it was back in the 50s again. It warmed up again a couple of weeks later, but my seeds never came up. Faced with the prospect of no tomatoes, I took myself to my nearest farm store and purchased 6 tomato plants, 2 Cherokee Purple, 2 Mr. Stripey and 2 Black Krim. I planted then on Friday. Now I have discovered that the front bed may get too much sun for too long each day. Given lots of water, the plants are still quite wilted at the end of the day. UPDATE: Photo added. This photo was taken at 11 am. The area was watered yesterday evening and again this morning about 7:30 and the middle plant especially is already wilting. I am not sure how I will do it, but I’m thinking I will need to create some sort of sun screen to shade the plants from the heat of the day. Any suggestions on how I might accomplish this? My garden helper sent these photos last evening with a report from the Country Garden. It seems some things are growing well and some things aren’t. No surprise there I suppose. 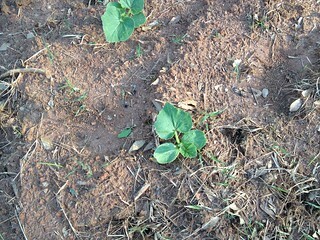 I was pleased to hear that both pumpkin patches and the squash patch were showing strong growth. The onions appear to be doing well as is the Popcorn so far. The Celeraic and the gourds are either a no-show or my garden helper just didn’t recognize the seedlings. He forgot to check on the sunflower seeds so I hope to get another report tonight. As you can see, the seedlings for the Red Warty Thing Pumpkins, at least two of them, are off to a promising start. With luck we will dodge animal, bad insect and disease this year and actually get a pumpkin or two. I’ve tried several times to plant pumpkin in the Carolina Victory Garden to no avail…squash vine borer and/or powdery mildew on the leaves has killed the plants well before maturity every time. The popcorn has a long way to go as well. Year before last I tried a little corn in the Victory Garden only to have the rabbits nibble it down to nubs. It occurred to me the other day that I need to do a little more research on popcorn. I have no idea what to do with it once it matures assuming it will get that far. I know it will have to be taken off the ear, but does it need to dry first? 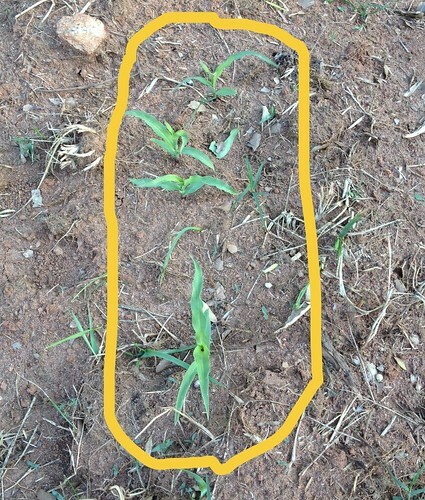 If you’ve grown popcorn do you have any guidance? 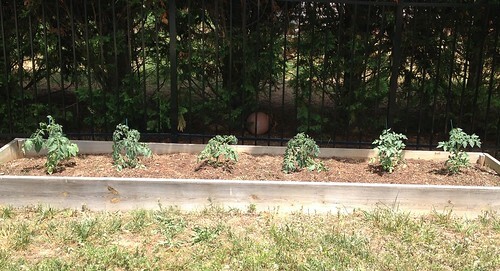 I planted tomato seeds in the Carolina Victory Garden during the fourth week in March. It was very warm and we were to be in the country and then very busy through Easter so I took a chance. I planted the rest of the garden Easter afternoon. Since then I’ve been watching and waiting. The weather turned cooler and we’ve had a few days of rain in between watering so things should have already begun to break through the soil…at least I think they should. At any rate, I saw this cute comic on the subject while reading the morning paper: Rose is a Rose sums up my feelings today when Mimi Exclaims “Wee shood ghet fahstur zeedz!